Charming and car free, Chora is the cream of the many fine villages in the Greek archipelago. 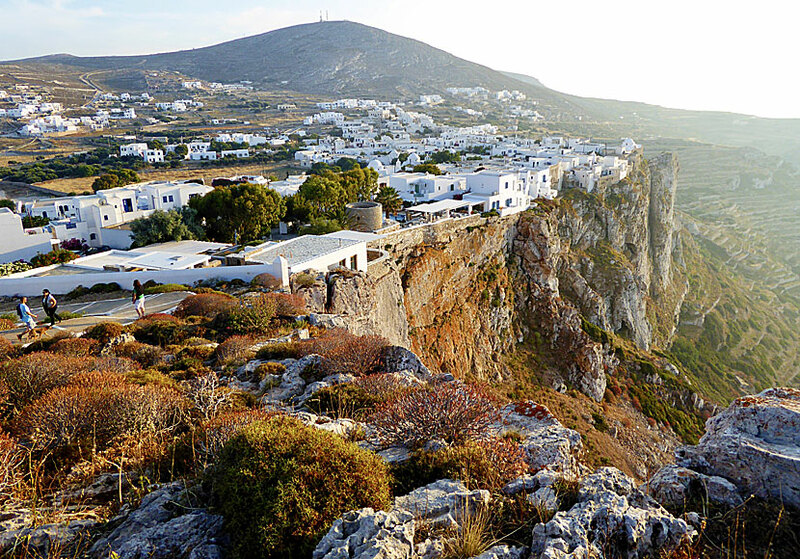 Some would probably go further than that and bring out Chora as the archipelago's finest village. 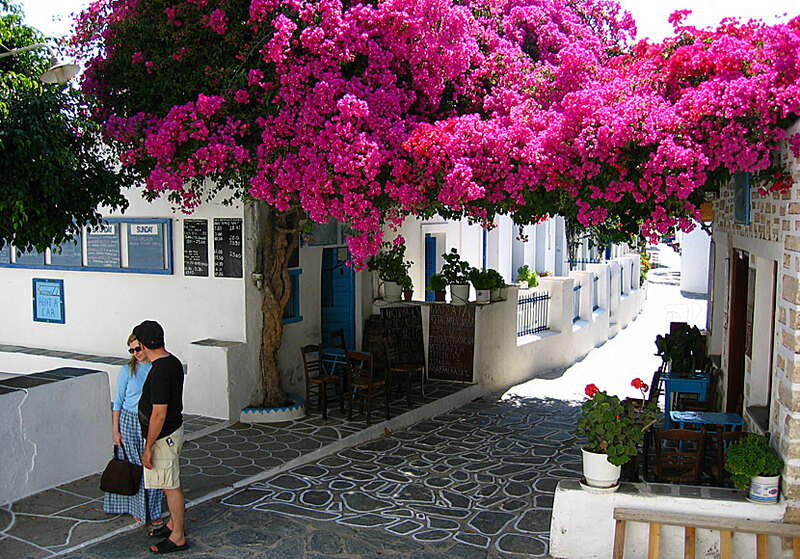 Personally, I think that Chora on Folegandros is one of the ten most charming villages. Chora seen from the Panagia Church. The village is like a symbol of how a Greek village should look like, as we see them on postcards and in travel magazines: narrow alleys where whitewashed houses with blue doors and shutters crowds with whitewashed churches and cosy squares and cosy tavernas, where half asleep cats doze on marble stairs, cafes where old men sits talking and handling their Komboloi (worry beads) - and the icing on the cake: blooming bougainvillea hanging down over the houses and the alleys. One of many bougainvillea trees in Chora. 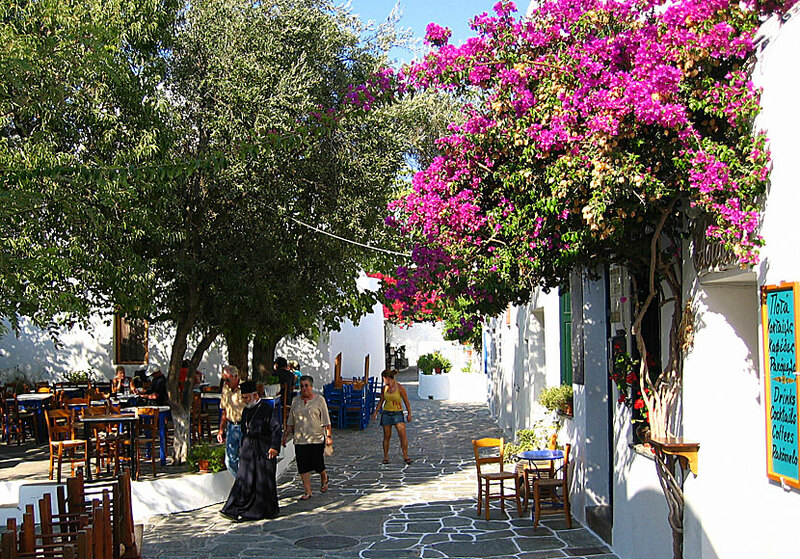 Although Chora is dominated by tourists during peak season, there is always a Greek everyday life around the corner. Just walk a few metres outside the centre, and you will meet cackling chickens and bleating goats. In short: Chora is just wonderful. On many other islands, the Choras are hilly - like Chora on Ios, Kea and Serifos - but Chora on Folegandros is flat as a moussaka. The village lies about 200 meters above sea level, the view is to say the least scenic, especially from the edge of Pounta Square. Stand close to the precipice and you will understand what I mean. Pounta Square is also many people's first meeting with Chora since the bus stops nearby (behind the Post Office). Above the square are several pensions. To get into the village's centre, follow the road that leads to the left. A few meters ahead is Dounavi Square, one of the village's many cosy squares. Here is Kastro Café, the fine church of Stavros (celebrated on 14 September), the travel agency Maraki, an ATM and the popular Taverna Nikos. Taverna Nikos seams to come from another planet, and I can imagine that some close their eyes when they walk by. I do not know if I've seen a place like this in Greece, and certainly not on an island of Folegandros' size. Nikos Taverna is a little more sophisticated than the usual Greek taverna. 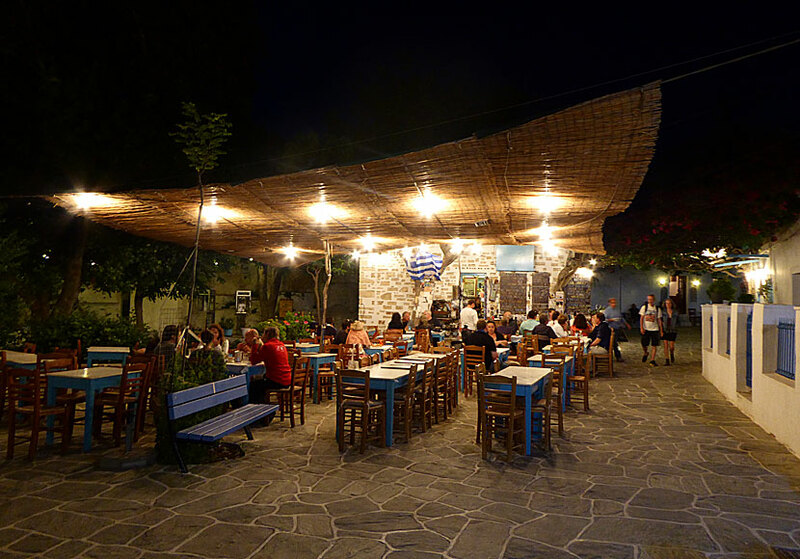 Many people like Nikos Taverna and may spend the whole day there: to read Nikos guides, to play some of the many games or just to listen to the beautiful music and to read a book. There is also food to eat, of course, the menu is probably the largest I've seen, and the kitchen is one of the smallest I've seen. Try the matsata, homemade pasta served with cockerel or rabbit in a red sauce. Matsata is something of Folegandros' specialty and are also served in other tavernas. If it is windy one evening and you feel cold, you can warm up with a rakomelo - flaming raki with honey - who Nikos claims to have invented, but it is offered on many other islands. All four squares in Chora are pleasant. They are all close to each other, you just walk a few steps and you enter a new square, where there are more tavernas, cafes, ouzeries and small bars. And churches, of course, there are no less than 13 in Chora. Plus they ones inside Kastro. To choose any particular taverna is difficult, the menus are similar (with the exception of Nikos) and most serves good food. One has to go by what looks nicest. And basically all tavernas look nice, so it's really hard to choose. There are also two gyros places serving excellent gyros. 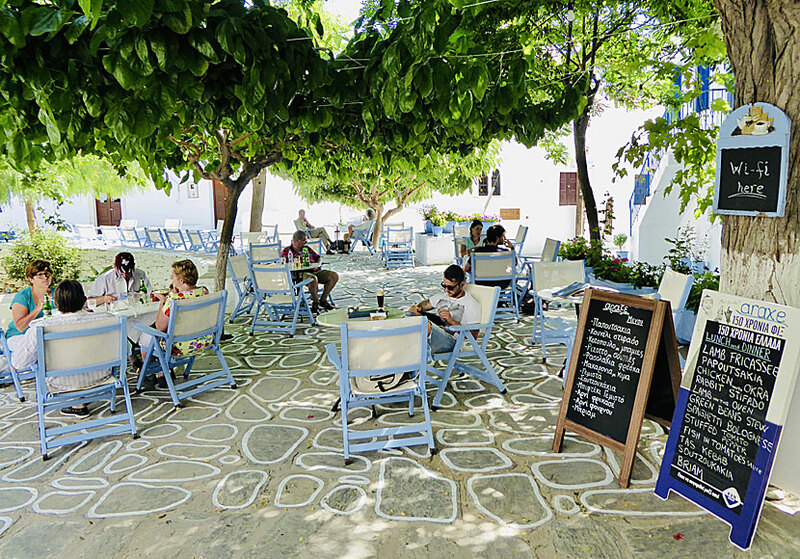 One of the cozy taverna squares in Chora. On a rock, above Chora, stands the beautiful church of Panagia. From the church, one can enjoy one of the most beautiful sunsets in the Cyclades. Opinion is divided about where it is best to stay on Folegandros. I prefer to stay in Chora. Mostly because I want to be close to all cosy tavernas, cafes and bars. During daytime it's a easy to go to the beaches, or maybe just to sit on one of the squares and read a book in its simplicity. If you want to have walking distance to the sea and to the beaches it is better to stay in Karavostasi. Chora seen from Ampelos Resort. We always stay at Ampelos Resort, which is a very pleasant family hotel just above Chora with stunning views over the village. The family hotel consists of five beautifully designed houses set around a swimming pool. Each house contains two apartments, one upstairs and one downstairs. To be on the safe side you should pre-book, Ampelos Resort is very popular and usually it's full. 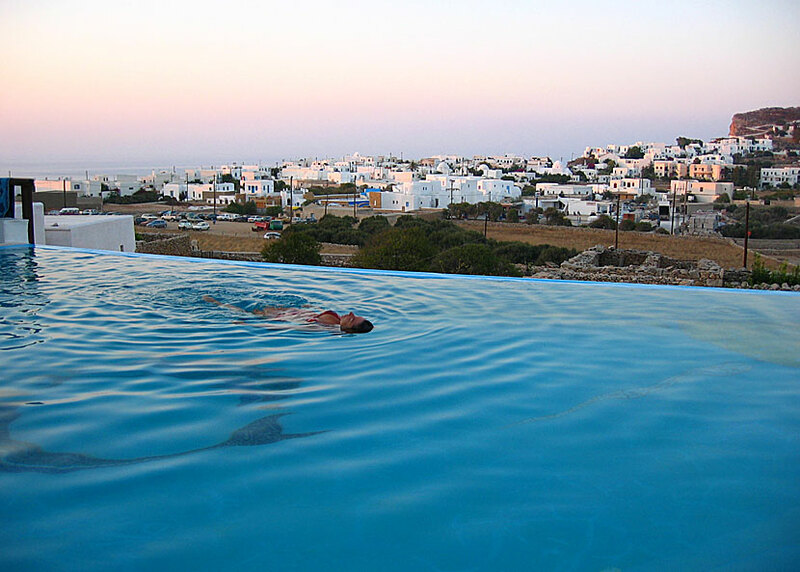 Other good hotels are Folegandros Apartments and Polikandia Hotel. One of the many cozy squares in Chora. Here you can sit and read a book or philosophize about life.